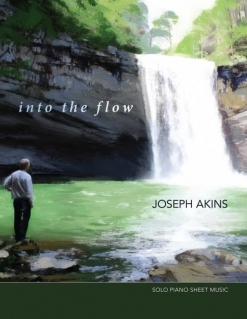 The Into the Flow songbook is the companion sheet music book to Joseph Akins’ 2017 recording by the same name. 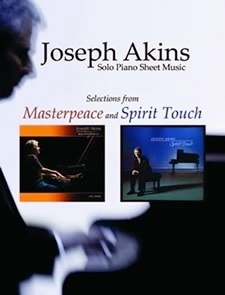 Eleven of the twelve pieces on the album are included in the book, transcribed note-for-note by John Zechiel. The only missing piece is the last track on the album, “Cosmic Microwaves,” which was a studio improvisation with effects added. The book is spiral-bound with full-color reproductions of the album cover artwork on the front and back covers. It’s a very attractive book, which makes it even more enticing to explore the music within! The pieces are printed on a sturdy bright white paper stock that should hold up well with heavy usage. The notation is clear, bright and well-spaced. I think most of the pieces in this book are somewhat easier than some of Joseph’s earlier books, but they aren’t simple. I would place the range at intermediate to early-advanced as some of the rhythms are a little tricky and a few are in fairly complicated key signatures. 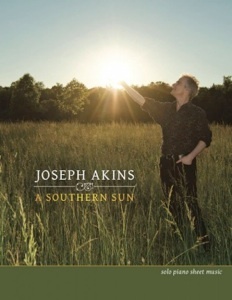 I love the variety in the music from gentle, relaxed ballads to a more down-home Southern style to complex jazz chords. It’s a really great book that I won’t be putting on the shelf anytime soon! I can’t wait to get in and learn “Ghost of Mill Wee Hollow,” “Winter Is Here” and “Mystery Cafe”! I didn’t encounter any reaches of more than an octave in any of the pieces. Chord symbols and metronome settings are included, as is pedaling. Any improvisations in the recorded music have also been transcribed. I really enjoyed the hour or so I spent playing the book and look forward to spending more time with the music! 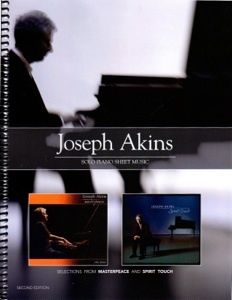 The songbooks are available exclusively from www.JosephAkins.com. Downloads of individual pieces or the full book are also available. Very highly recommended!